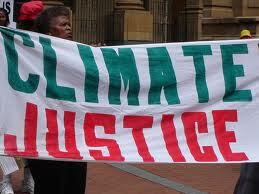 An Ethical Analysis of Warsaw COP-19 Outcomes In Light of the Ethical Dimensions of Climate Change. If climate change is a world challenging ethical and justice problem, what can we learn from the state of recognition of this fact from the recently concluded Warsaw climate negotiations? The 19th Conference of the Parties (COP-19) under the United Nations Framework Convention on Climate Change (UNFCCC) and the 9th Meeting of the Parties to the Kyoto Protocol (MOP-9) completed its work on Saturday 23, 2013 in Warsaw. COP-19/COP 9 was seen by most observers as another in a series of extraordinarily serious failures of the international community to find a global solution to climate change, a tragic outcome in light of the hard-to-imagine global greenhouse gas (ghg) emissions reductions that the mainstream scientific community is now saying are urgently needed to prevent dangerous climate change. Yet the November meeting did produce a few very, very modest results that managed to keep the slim hope alive that an adequate global solution to climate change will be worked out in 2015. We here review the outcomes of Warsaw through an ethical lens to determine and draw attention on the ethical issues that need to be emphasized as the world approaches the next negotiations in Lima, Peru in December. A major hope for the Warsaw COP was to make significant progress on negotiation of new treaty which is to be completed in 2015 in Paris as agreed to in climate talks in Durban, South Africa in 2011. 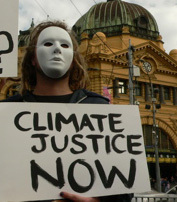 (UNFCCC, 2011 ) The Durban COP decided to create a global climate agreement applicable to all parties by 2015—known as the Durban Platform—with the goal of keeping average global temperature rise to 2° C, the level that scientists claim is necessary to avoid the worst impacts of global warming. A main task for the parties in Warsaw was to establish a process and timetable for creating the new agreement to be finalized by 2015. Other major issues in Warsaw included whether the international community would make progress on: (a) implementing past promises for funding needed climate adaptation in developing countries, (b) creating an institutional response to nations and peoples who suffer losses and damages from climate change, and (c) creating an institutional response to forest degradation and destruction. At the center of the most contentious issues at COP-19/MOP-9 were conflicts about what justice and equity require of nations to respond to climate change. A. Pathway to An Adequate New Climate Change Agreement. The agreement to be completed in 20I5 under the Durban Platform will take the form of a “protocol, another legal instrument or an agreed outcome with legal force,” and will be applicable to all Parties. An adequate global climate change treaty will need to limit total global ghg emissions to levels which will prevent atmospheric ghg concentrations from accumulating to dangerous levels and to do this any solution will also need to allocate total global emissions levels among all nations. Therefore nations must agree to commit to limit their emissions to their share of safe global emissions if there is any hope of preventing harsh climate impacts. Since COP-18 in Qatar last year, there have been two prestigious scientific reports that have made it clear that much greater ambition from nations on their previous ghg emissions reductions commitments is urgently needed. In September of this year, the Intergovernmental Panel on Climate Change (IPCC) issued a report on the Physical Basis of Climate Change and in November the United Nations Environment Program (UNEP) released its Emissions Gap Report. Both reports contain information that lead to the conclusion that the international community is quickly running out of time to prevent dangerous climate change. The UNEP report is particularly relevant to the short-term situation that was the focus of the Warsaw meeting given that the international community has agreed to limit future warming to prevent catastrophic warming to 2° C or perhaps 1.5° C if studies that are now underway demonstrate that a 1.5° C warming limit is necessary to prevent catastrophic harms. The UNEP report found that even if nations meet their current climate pledges, ghg emissions in 2020 are likely to be 8 to 12 gigatonnes of CO2 equivalent (GtCO2e) above the level that would provide a reasonable chance of avoiding the 2° C warming limit. To be on track to stay within the 2° C target and head off very dangerous climate change, the report concluded that emissions should be a maximum of 44 GtCO2e by 2020 to set the stage for further huge cuts needed to keep warming from exceeding the 2° C target. Since total global ghg emissions in 2010 already stood at 50.1 GtCO2e, and are increasing every year, reaching a 44 GtCO2e target by 2020 is extraordinarily daunting and much greater ambition is needed from the global community than can be seen in existing national ghg emissions reduction commitments. Moreover if the world continues under a business-as-usual scenario 2020 emissions are predicted to reach 59 GtCO2e. And so increasing the ambition of national ghg commitments is urgently needed to provide any reasonable hope of limiting warming to non-catastrophic levels. For this reason there was some hope before Warsaw that some nations would make significant increases in their previous ghg emissions reduction commitments. This did not happen. Not one single country increased its previous emissions reductions commitments in Warsaw and Australia and Japan announced they were lowering prior promises. There is a growing consensus among many observers of international negotiations that the international community will fail to increase ghg emissions reductions commitments to levels that will avoid dangerous climate change unless nations take their ethical obligations to other nations and vulnerable people seriously. 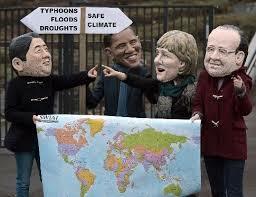 Nations continue to enter climate negotiations as if only their own economic interests count. And so, most nations are continuing to ignore their responsibilities to other nations and people when making national commitments on ghg emissions reductions. To change this, the UNFCCC should require that when nations make emission reduction commitments they must explain three things. First, what ghg atmospheric concentration level is their target designed to achieve. Second, what is their assumption about the remaining ghg emissions budget that the entire international community must stay within to avoid dangerous climate change. Third on what equitable principle is their national target based to that would achieve the safe atmospheric ghg concentration level. In short, nations should be required to explain expressly how their emissions reduction target has been developed in consideration of equity and distributive justice. The September IPCC report contained an emissions budget on total CO2 emissions for the entire world. If the international community limits ghg emissions to the budget amounts, there is 66% chance of preventing very dangerous warming. The IPCC said that for warming to remain below dangerous levels, the total amount of CO2 equivalent that may be emitted is 431 gigatons. This further means that the budget would be completely used up by current emissions by around 2044, just over 30 years from now. If ghgs other than CO2 that are being emitted around the world are taken into consideration, the remaining CO2 equivalent emissions budget is reduced to approximately 270 gigatons. This fact has led many climate scientists to strongly warn the international community that it is running out of time to prevent dangerous climate change because the world will exceed the budget in 25 years at current emissions rates. In light of these reports, UNFCCC Executive Secretary of the UNFCCC Christiana Figueres said at the beginning of COP-19 that: “Global greenhouse gas emissions need to peak this decade, and get to zero net emissions by the second half of this century. In addition to increasing national ghg emissions reductions commitments in the short-term there was some hope that Warsaw would put into place initial elements of an emissions reduction framework that would be included in the new treaty to be completed in 2015. Yet this did not happen either. The only positive outcome of COP-19 in regard to adequate ghg emissions reductions commitments was a decision that all nations would submit their new ghg emissions reduction commitments by the “first quarter of 2015” in time for consideration during the final treaty negotiations in Paris that year. There was intense disagreement in Warsaw about whether levels of historical emissions should be taken into consideration in allocating national emission ghg reductions levels under the new treaty. The U.S. and European Union blocked a proposal supported by 130 nations including Brazil and China that would use pollution levels dating back to the industrial revolution to help set limits on emissions in the future. According to a November 16th New York Times report, discussions on equity and justice became an emotionally charged flash point in Warsaw. No nation should be able to escape explaining the ethical principles on which its ghg emissions reduction commitment is based. In a previous entry in Ethics and Climate we explained why strong ethical claims can be made that nations have clear duties to reduce their emissions to their fair share of safe global emissions. In 2009, developed countries committed to annually mobilize $100 billion from public and private sources for climate mitigation and adaptation by 2020 in developing countries. Countries also agreed to the creation of the Green Climate Fund, or GCF, which would provide a significant portion of the $100 billion commitment. For the most part promises to provide specific amounts of funding have not materialized. As a result the Group of 77 developing nations and China unsuccessfully pushed in Warsaw for specific funding pledges for the period before 2020. Although there were several countries in Warsaw that made small new pledges for funding for adaptation, for the most part the developed nations have failed to identify specific amounts of funding consistent with prior promises. A decision was made that simply requests that developed countries to submit specific pledges at workshops to be convened on the issue and asks developing nations to submit ideas for a high-level ministerial dialogue on climate finance every two years, starting in 2014 and ending in 2020. COP-19 also approved a decision urging the fledgling GCF to ensure it is operational in time to begin receiving funds next year. The decision calls for “ambitious and timely contributions” by developed countries to the fund before the next round of high-level talks in Peru. All high-emitting nations must be required to explain, as a matter of ethics and distributive justice, why they are not responsible for their equitable share of adaptation costs for vulnerable developing nations. In so doing they should be forced to explain whether they disagree with the “polluter pays” principle. In a previous entry in Ethics and Climate we explained the basis for concluding that high-emitting nations have strong ethical duties to fund reasonable adaptation measures in vulnerable poor countries. Issues entailed by discussions on creating an institutional response to losses and damages from human-induced climate change were particularly contentions in Warsaw. High-emitting developed nations have been particularly concerned about creating an institution that would act as a mechanism to compensate nations and peoples who are harmed by human-induced climate change. Two questions in particular about the prospective mechanism caused controversy in Warsaw. The first was whether a new mechanism would be an independent entity within the UNFCCC, which already contains two semi-independent institutions on mitigation and adaptation. Negotiators from low-lying islands and other developing countries argued that devastating human-induced climate change damages are now visible around the world and therefore a new separate loss and damages mechanism under the UNFCCC is needed. Some developed countries supported the creation of a mechanism but opposed the creation of a new independent funding institution and argued that losses and damages funding should fall under the adaptation framework. The United States and other nations have resisted discussing responsibilities for loss and damages from climate change for several reasons including the fact that assigning specific responsibility for harms is a difficult question about which reasonable people may disagree. These countries should be required to explain why they are ignoring the “polluter pays” principle and ethical responsibility that is entailed by basic principles of distributive justice. 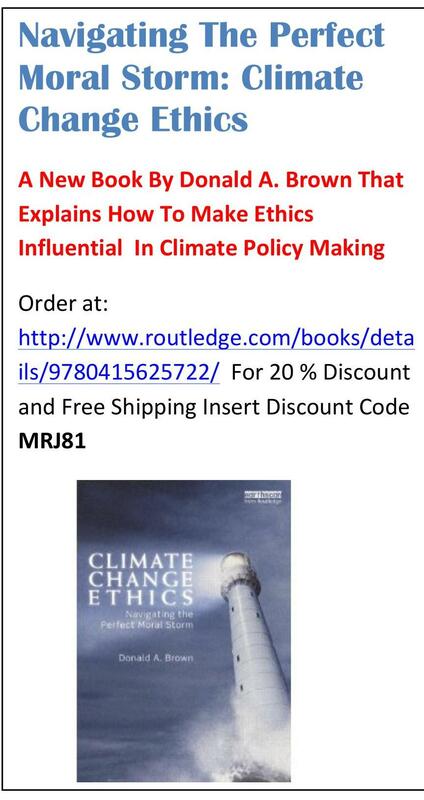 In a previous entry in Ethics and Climate we explained the basis for concluding that high-emitting nations have strong ethical duties to compensate losses and damages from human-induced climate change particularly in vulnerable poor countries. Since 2005, UNFCCC negotiations have worked on establishing a program on reducing emissions for deforestation and degradation of forests usually referred to as REDD+. Conquering deforestation is an important element in a global solution to climate change as emissions from loss of forests represents approximately 20 percent of worldwide greenhouse gas emissions. Establishing REDD+ has been challenging for several reasons including establishing credible quantitative measures for measuring precisely the amount of emissions saved from programs that prevent emissions from deforestation, assuring that the emissions saved by funded REDD+ projects are permanent, and determining how investments in deforestation programs might work with other market mechanisms under the UNFCCC. Warsaw made considerable progress on for REDD+ issues that included a series of seven decisions that outline issues relating to payments to developing countries implementing REDD+ projects, a framework for establishing a formal REDD+ mechanism, some rules for creating performance-based financing mechanisms, and forest monitoring systems, and establishing forest reference levels among other issues. Because all high-emitting nations have clear ethical responsibilities to reduce ghg emissions to their fair share of safe global emissions, high-emiting nations should be required to explain how they will reduce their ghg emissions to their fair share of safe global emissions if they do not financially support programs that reduce forest degradation. The next COP will be held in Lima, Peru in December of 2014 which will mostly focus on the details of the new international climate agreement that is scheduled to be completed in 2015. Ethics and justice issues were central to the most contentious disputes in Warsaw particularly in regard to ghg emissions reduction commitments and funding for adaptation and loss and damages. This fact was recognized by the international media covering Warsaw more frequently than ever before as we have explained in a previous entry here on Ethicsandclimate.org. Yet neither nations or the press covering Warsaw appear to be recognizing the significance for climate policy of the equity, ethics, and justice issues. For this reason, there is a continuing urgent need to increase awareness around the world of the practical significance of the ethics and justice issues for policy. Part Time Professor, Nanjing University of Information Science and Technology, Nanjing China.